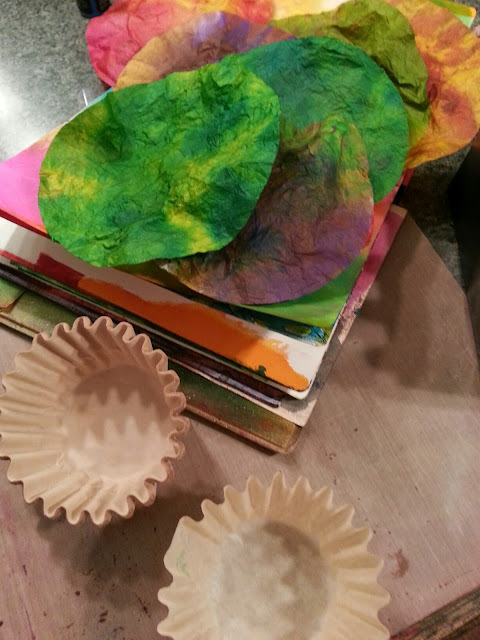 The Gentleman Crafter: Getting Dylusional with Coffee Filters??? Hope your mid-week has been going good! It's been a wonderful day today! I treated myself to a movie and some time to play in my art journal. The movie...totally amazing! Sad, but happy! Hard to explain. It's an oldie but goodie...Life Is Beautiful...I couldn't peel my eyes away from it. Maybe that is exactly why I'm stained from head to foot with Dylusions Ink Sprays! LOL! Seriously! New white shirt....TOAST! LOL! Tonight, I was in the kitchen making some real coffee as I'm out of my beloved Keurig coffee pods. Got out the filters, scooped the coffee, poured the water and set it to brew. Well, there they were, the filters that everyone uses to do cool stuff with. So they made it about as far as the kitchen island when I went running into the studio for the Dylusions Ink. I couldn't stop spraying multiple colors all over the filters. 30 filters Jimbo...Come On! Well, it was fun seeing how the sprays reacted to the coffee filter paper. I can always use them later right? 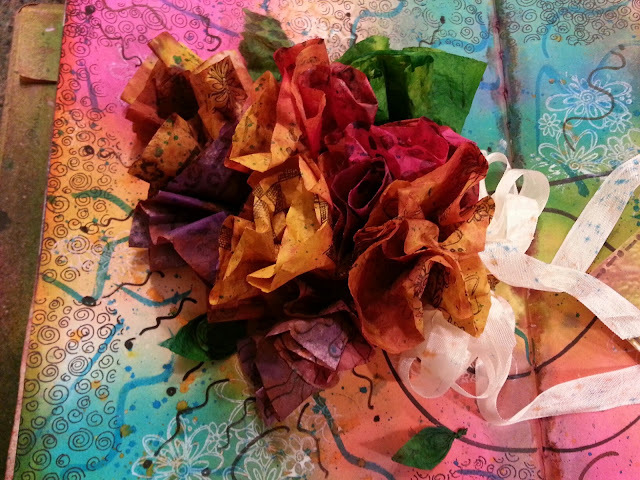 I then dried the filters with my heat tool, stamped on them and placed them into a bouquet in my art journal. I added some background noise, a ribbon to the bouquet, a few leaves, a tag, a quote and called it a day by the close of the movie....LOL! I am always amazed by the vibrancy of these inks. 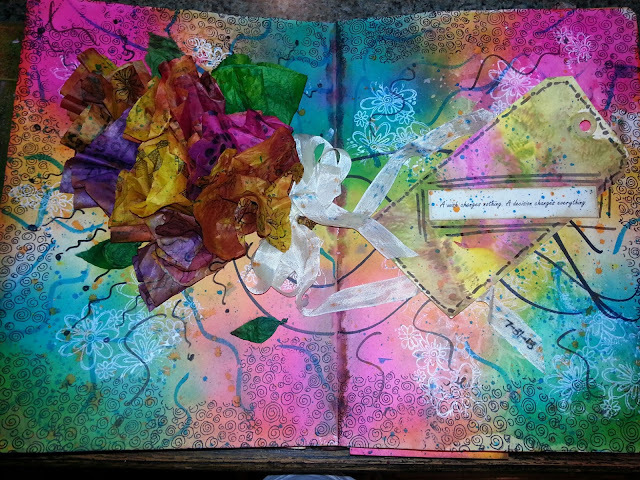 sumptuous journal pages. Well doggone, I believe you have inspired me..........Check out my blog tommorrow! These are cool. What kind of ribbon is that? I really like it. P.S. Did you save a filter for coffee this morning? It's seam binding....yes, I saved a few! LOL! Gorgeous! Love all the bright colors. Love the bouquet!! How very clever you always are!!! Stamping on them probably would never have occurred to me!!!! LOL!!! Brilliant! And now you have a new shirt to "play" in!!!! Such a pretty bouquet!! And now I'm even more envious of you. Not only are you a genius crafter & artist, but you also have a Keurig machine. I fell in love with Keurigs when I was on vacation in Los Angeles a few years, they're the best. Unfortunately, they're not available in the UK. Actually, maybe that's a good thing..... :) Have a great weekend. WOWZERS!!! Love, LOVE the coffee filter bouquet!!! Hint...you might want to gift bouquets to a couple old ladies you know...just sayin'. LOL!!! You know I don't do coffee and now you're gonna make me go buy coffee filter, aren't you?!?!? And...why in the name of all that's Good and Holy would you start Dylusion-ing in a good WHITE shirt?!?!?! Sorry about your shirt but your project turned out great! That is AWESOME! The colors are beautiful, bright and WOW! Only you would turn coffee filters into a beautiful bouque of flowers. Again AWESOME! Gorgeous Jim!! I'm so happy to hear (read) that you still get excited when you something 'hits' you... I can just picture you spritzing your filters with a happy glint in your eye. I lol'd when you said you could use them later because if you use them in your coffee pot, then you'll have some fun colored coffee... bwahahaha. Think the flower turned out great and love the page.... I have a lot of chunky things in my book and when closed, the cover is about a 45 degree angle. lol Glad you had a good time creating! Caffeine deprivation makes one do crazy things. ;) In this case your filters turned out beautifully - great quote too! Fun Jim! I love using them to make ghosts with lollypops for the kids. Can't wait to try spraying them! WOW, gotta love those filters. They made beautiful pages in your journal. 30 Filters JIMBO, really? hahaha I can so see you doing this. They turned out fabulous. I will be interesting to see what the bouquet looks like by the time you get to the end of your journal. It will take on a whole new personality I am sure. VERY nice! The stamping on them really enhanced their personality. One never knows when an idea will strike or what might cause it. The best thing to do, as you did, is follow it to see where it goes. You sound like you have more shirts with paint on them than actual shirts you can wear to work, as do I. Again, that "now's the time" thing comes into play and causes a lot of stains on perfectly good clothes. It's a small price to pay for the end result. Jim, you now have a designated Dylusions shirt. I am wondering if you ever got your cup of coffee or did you get carried away in a forest of coffee filters. How beautiful they are. Those colors are irrisistable. Best pop a bouquet over to Barb with some Italian stamped on. I love what you have done! The colors and stamps are perfect! Job well done. I just love your coffee filter flowers!!!! So much fun.....gotta make some?..they are FANTASTICO!!!!!!! Wonderful flowers and pages! Fun, fun, fun. You have made me think about coffee filters in a whole new way. Thanks for sharing. You are sooo creative! I love the bouquet with the ribbon. I've always thought that seam binding is beautiful and versatile. And coffee filters, great substrate. You must be Dylusions number one advocate, besides Dyan herself. I'd love to see a post of your totally toasted new "white" shirt. Those are just too cute! Imagine a 'Dylusional' bouquet for a bride to be or bridesmaids....Love it!!! Thanx so much for sharing! Oh your pages are Gorgeous! I just love those inks so vibrant! But how fun to play with those filters! I think I have some of those hiding somewhere!!?? I am going to have to try this, although I don't know if I could do a bouquet as beautifulk but I think I am going to have to try! Thank you for sharing with us! I love seeing it! I wail like a baby every time I watch that movie. 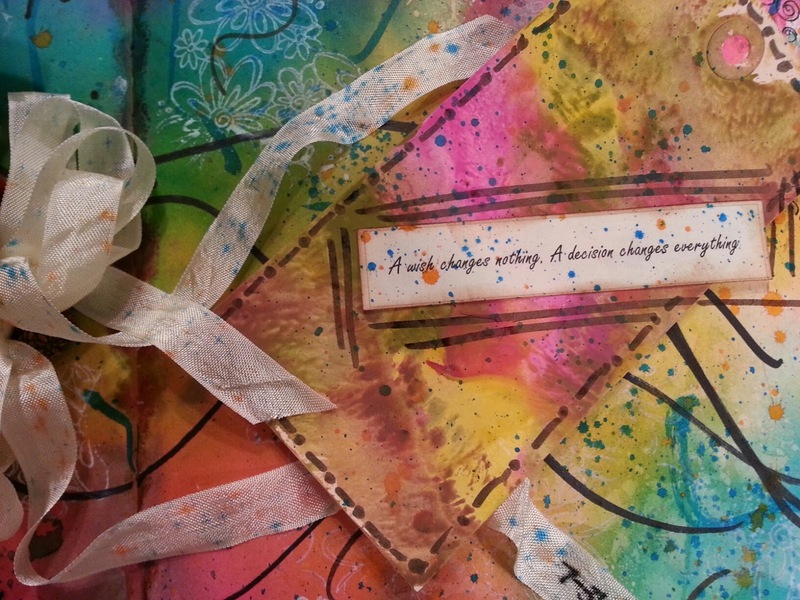 It looks like you are having a spray-blast of a time with your new crafty, inky toys! LOVE IT!!!!!!!!!!!!!!!!!!!!!! The best thing about creating things is playing with lots of things. Remember there are no mistakes. 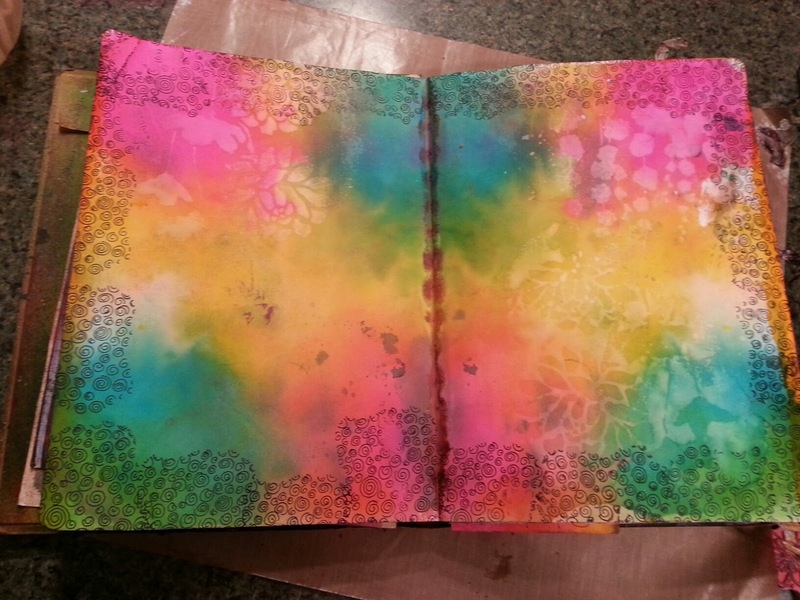 I love the backgrounds in your journal and I'm glad that you had fun spraying all those coffee filters! Go on - show us your "new" shirt - you know you want to! Actually I've just had an idea. You know how Tim sells sweatshirts and aprons? Why don't you start your own line of fully customisable blank substrate shirts for Dylusioning - perhaps with a more expensive, ready made version?! I'm sure they'd be a great hit! Wow such a simple yet brilliant and beautiful idea! lovely work. You mean you haven't bought coffee filters JUST for spraying? I can't believe it! And Krud Kutter from Amazon will take the spray outta your white shirt. Amazing stuff! Cleans acrylic off brushes, too! Even when dried! 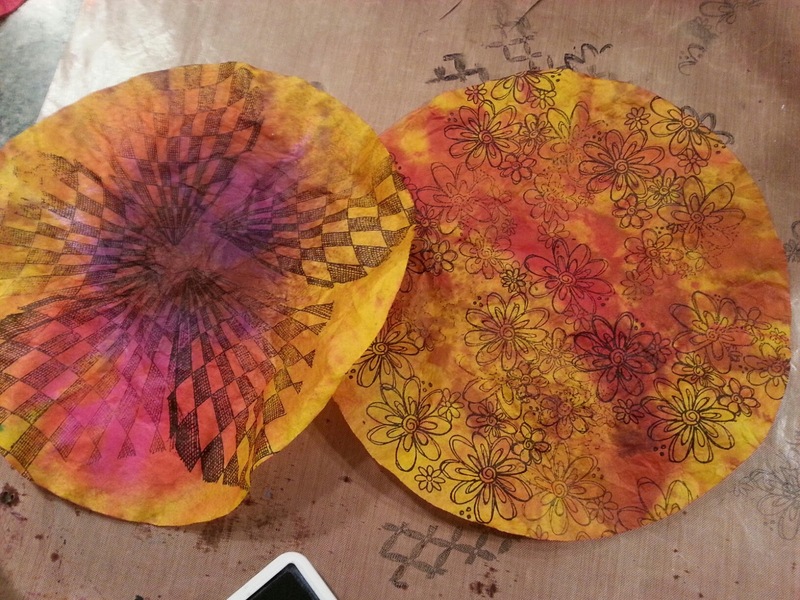 AND it gts dried acrylic offa stencils! The colors are so vibrant and cheerful they make my heart sing!!! I WISH I had some dylusions spray!! The colors are gorgeous on the filters.